Nike’s new campaign, which launched Labor Day weekend, shows the brand taking a stand with Kaepernick, whose profile is featured in the image with the words “Believe in something, even if it means sacrificing everything.” It’s part of Nike’s new edition of the “Just Do It” series that shows athletes rising to overcome adversity and challenges. The visceral reaction from people everywhere provides us with proof that brands like Nike can have a voice in a social conversation. Whether or not they received a positive response from the overall population isn’t the point. Nike had a specific audience in mind. And in that regard, this ad campaign was a complete success. But it is more than just advertising. Nike, the company, has an opinion. And as any well-trusted brand should do when they have a stance, they’re taking a stand for what they believe in. We’ve seen a lot of data-based articles out there-- and we mean a lot-- trying analyze the reaction to the campaign. But these analyses miss the mark on how they measure the data. There are better ways to document how well people view campaigns going beyond just basic sentiment analysis of all audiences. First, you need to look at the right audiences. Then, you need to dig in to understand emotional drivers and, of course, the purchase behaviors of those audiences. So, why did Nike feel like this was the right conversation to take part in? Which audiences were they targeting and how did those audiences respond? We’ll put the brand to the test in our social listening tool to see just how consumers actually feel about all this noise. In this analysis, we’ll look at why it makes sense for companies to get involved in a polarizing conversation, especially when they’re a trusted brand amongst their target audiences. We’ll see how those specific audiences responded with emotional analysis. And we’ll get a verdict on how successful the campaign is. First, let’s see why this type of campaign makes sense for Nike’s brand and what other brands can learn. The thing you’re probably not considering is this: Nike doesn’t care if some people (most people?) don’t like the ad featuring Colin Kaepernick. The people who don’t like the ad are not their target audience. Since January of this year, post volume for those in the younger audiences, Gen-Z and millennials, have outnumbered posts from all other audiences nearly 3-1 (5.6 million compared to 2.1 million). Clearly, younger audiences are Nike’s group. So, are they telling the right story to the right audiences? There’s nothing new behind the strategic implementation of their messaging. Nike has been one of the top brand storytellers on earth for decades. They’re the gold standard for creating compelling stories with mantras that have been copied and copied again. They have always accomplished their storytelling prowess by creating “water cooler moments”. In other words: they get people talking with their moving, inspiring, striking, surprising and otherwise memorable messages. This is a brand that pushes the envelope with their message, then inspires people to do the same within that message. That’s the spirit of “Just Do It”. Another thing that isn’t new for Nike? Social activism. They’ve always been outspoken advocates and that is one reason why they have cultivated a loyal and trusting audience of fans who love Nike-- not just their products but the brand. It’s clear from their content and messaging on all of their owned entities that participating in a social issues conversation is in line with their brand. People want something to believe in. Research consistently shows that they have positive feelings toward companies that get in on important conversations. 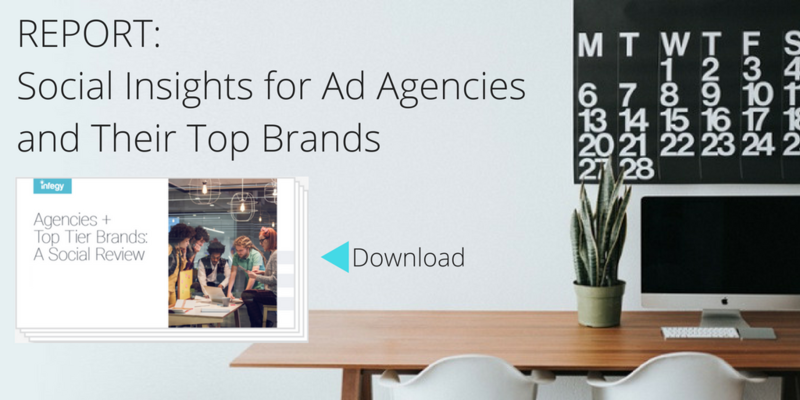 According to WWD, one study found that 86% of people want brands to take a stand on social issues and that 64% of customers say they will very likely buy from brands that make a pledge. In particular, Gen-z and Gen-y, their target demo, are known to take a large stance on what they believe are social injustices. This kind of branding is nothing new for Nike. And they’re delivering what their audiences want. But that’s not the full story. Nike also makes bold moves like the Colin Kaepernick campaign because they have a stance on a social issue they actually believe in. You’ll see that staying true to their beliefs over time has earned Nike’s faith and loyalty from an adoring fan base. Nike is trusted by their audiences. When analyzing conversations around Nike and their competitors, we can see that consumers talk about trust with Nike more often than any other brand in their category. When talking about Nike, nearly 5% of user posts express trust in the brand over the last 6 years according to our analysis. The social listening analysis of online conversations above shows the level of trust expressed in brands by online audiences. Nearly 5% of user posts express trust in the Nike brand in the last 6 years according that data. Brands that garner a consistent high level of trust from their audiences are ones that have bigger staying power. According to Nielsen, brand trust was the number one reason why consumers said they purchased from a brand: 62% of people said that trust was the most influential factor in whether they gave a company their money. The data backs up these studies. 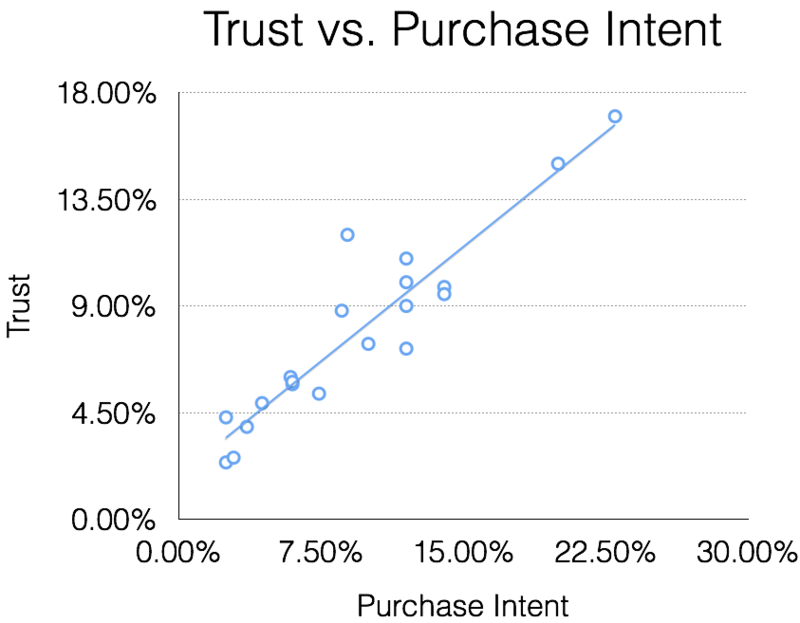 Brand trust has a nearly perfect correlation with showing an intent to purchase. Nike knows they are trusted brands amongst their target audience. Thus they know their brand, and the products, will stay center stage even when they do something polarizing, because their audiences trust them. This is because brave brands are trusted brands. The most trusted brands are also the ones that can make bold moves like Nike has done here. As Nike maintains their loud voice in the conversation of social issues and advocacy, they’ve proven that it aligns with their audiences interest and passions for those conversations. We know that trust in a brand is essential. The question is, what happened to Nike's trust score during their campaign. 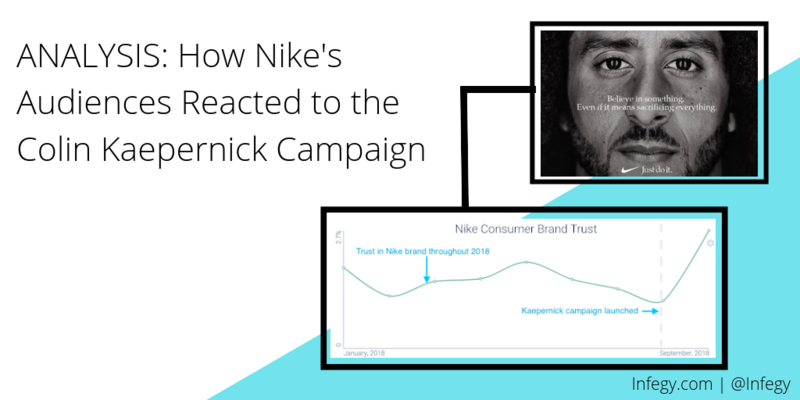 You’ll notice that starting in September, when the campaign first launched, Nike’s target audiences show they trust the brand more. In the early moments of the campaign rollout, there were a lot of questions as to whether this was the correct move for the brand. Their stock prices took an immediate drop leading to speculation of the wrong choice. As the immediate polarizing reactions have started to dwindle we can now more effectively judge the campaign and make assumptions as to what Nike was trying to prove. Now weeks after the campaign, proof that the that Nike struck a chord with their target is clear. A sales increase after the campaign, posting a $6 million market value, and earning their best stock share in their company history shows that their target audiences reacted well and so did the market. If you look at overall online audience sentiment, you’ll see a clear negative trend from consumers toward Nike since the Kaepernick campaign. Nike had a goal to appeal to their target audience. When analyzing how their core audience felt about the Nike campaign — the people who discuss the brand frequently, GenY and GenZ — you see that there is a pretty large swing in how Nike’s advocates and target audiences feel towards the brand, compared to all audiences. Nike fans sentiment toward brand peaked at 89% just two weeks after the ad. You can learn more with an emotional analysis of online conversations. There was a great deal of anger online at the Nike brand after this campaign. But looking at the audiences Nike cares about, you’ll find that they the “joy” emotion compared to those user posts that expressed anger is more than double. Linguistics analysis for each audience analysis paints a different picture than that of the feedback you thought you heard about this campaign. The word clouds from this audience segment also shows people discussing important topics more positively than Nike. The important takeaway here is this: from a business perspective, Nike wants to appeal to those in their target and those who already have an affinity for Nike. In that, the data is clear: this was a success. This all adds up to a calculated risk that paid off. Did Nike Just Do It for the Advertising? In the end, Nike isn’t going anywhere. And it never was. They took a bold step with a message they knew would resonate with their audiences, and that’s really what they should care about most. This is a lesson for brands -- find a message that connects with a trusting and loyal audience, an audience that engages with brands that fight for a cause that’s important to them.